Both a baroque thriller set in New York's ballet demimonde and a portrait of artistry as schizoid perfectionism, Darren Aronofsky's new film percolates parallel lines of fine madness---but then, doubling down on duality is this movie's raison d'etre. Promising ballerina Nina (Portman, carnal and emotive for once) wants the lead role in the NYCB's production of Swan Lake. The company's reptilian impresario (Cassel) thinks she'd nail the virginal White Swan; the character's evil twin, however, may be beyond Little Miss Goody Toe-shoes. Enter Lilly (Kunis), a free-spirited new dancer who bears an uncanny resemblance to Nina. Suddenly, after drawing blood from a stolen kiss, Nina nabs her dream part(s). She's also seeing her reflection rebelling in the mirror, and...are those pitch-black feathers growing out of her back? Monochromatic doppelgngers dominate from the get-go, and while Aronofsky's parable about creative repression gets heavy-handed---really, a symbolically broken music box?---the Pollyanna-stuck-in-a-Polanski-movie potboiler it's paired with remains on point. Having jettisoned his earlier "Look, Ma!" stylistics for a faux-vrit vibe in The Wrestler, the director melds both styles here to mind-boggling effect, with Matthew Libatique's south-of-grungy cinematography adding a dark edge to the hallucinogenic psyche-unraveling interludes (call it "magick" realism). Those doubting his mastery of the form need only witness the showstopping moment when Portman transforms into her avian character onstage, or the climactic sequence in which her performer-as-phoenix character figuratively burns herself into ashes. This is where Aronofsky's pas de deux with the audience pays off; gracefully guiding us through surreal hearts of darkness and into the blinding floodlights of artistic nirvana, he demonstrates a batshit brilliance that few modern American filmmakers can match. Despite the good reviews, I’m sadly not very impressed. I feel this movie uses a few too many clichés to make its plot go forth. 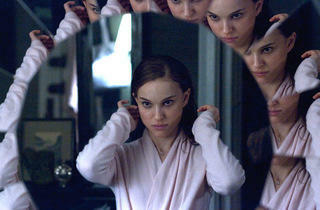 Portman plays a rather reserved woman. Her dance style obviously reflects her personality – she has great technique but lacks emotions. She is the White Swan. Her frigidity is explained by the fact she lives with an overprotective mum. Opposite is Kunis, who portrays the Black Swan. As a dancer she lacks technique, but has great sensuality. As a person, she’s outgoing, free and uses her sexuality freely. This duo of contrasting characters is more than banal; it is plain stereotypical. And because of this, I feel the storyline couldn’t but be utterly predictable. Jumping from one cliché to the other, this film leads to an unsurprising and anticlimactic ending, leaving the audience (me) truly bored and dissatisfied.